Highlight your premium products with LED lights! 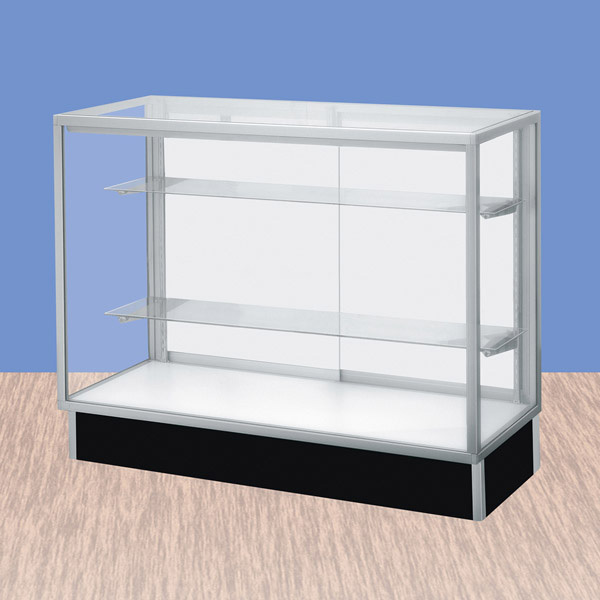 High front viewing area allows customers to get the best view of your products. Unit is equipped with long-lasting, energy efficient LED lights which will shine your products. Aluminum framed showcase has a durable laminated wood base and tempered glass top, front, and sides. Showcase has a 6 in. black toe kick, a white interior, and white finished sliding doors. (Mirror doors are also available, search Mirror Doors on our site). Showcase has two rows of adjustable 3/16 in. split glass shelves. Adjustable top shelf is 10 in. D and bottom shelf is 12 in. D. Includes chrome finished brackets and standards. Please allow 2-4 business days lead time for this unit to ship assembled!